Disney’s Be Our Guest restaurant, located in Fantasyland in the Magic Kingdom at Walt Disney World, is not a normal Disney character meal. Some restaurants at Walt Disney World feature Disney characters that go table to table to meet the guests, offering photo opportunities you may not get otherwise. In the Magic Kingdom, character meals include Crystal Palace and Cinderella’s Royal Table. You will notice that Be Our Guest is not included in that list. That is because Disney characters are NOT available at Be Our Guest (most of the time). Breakfast and Lunch – For both meals, Be Our Guest is considered a Quick-Service meal, you order via a kiosk, pick up your food and take it to your table. Other than dining inside of Be Our Guest, the meal itself isn’t much different than eating at any of the other Quick-Service places in the Magic Kingdom. There are no Disney characters to be found during breakfast or lunch. 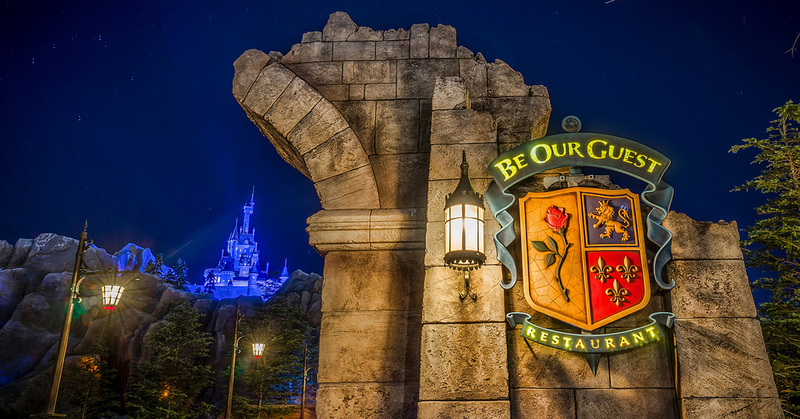 Dinner – For Dinner, Be Our Guest transforms into a Table Service restaurant, complete with waiters/waitresses, a nicer menu, and Disney characters. Well, kind of. Beast appears in his little library area (it is actually the area where you order your food for breakfast and lunch), and is available for photos with your family. Disney suggests that you meet Beast on your way out of the restaurant. Beast does not go table to table, you must go see him. And remember that this is Beast’s castle you are dining in, Belle isn’t anywhere to be found (you will have to head over to Belle’s attraction next door, Enchanted Tales with Belle in order to find her). Be Our Guest is super popular, by far the most difficult dining reservation there is at Walt Disney World. But remember, you are not booking a character meal, so if your kids want to see characters, look elsewhere.